Available as both a spiral pad and a booklet, these Kraft Paper Sketchbooks contain a special, acid-free sketch paper that is ochre in colour. This coloured paper is excellent for sketching as it creates an interesting background. The spiral variant of this sketchbook is excellent for drawing on location as the cover can be fully opened to provide a sturdy base. The spiral sketchbook also has a pocket in the back cover with space for notes and other souvenirs, and a black elasticated strap to keep the book closed when not in use. 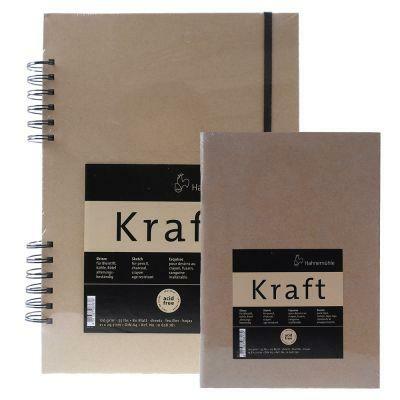 Each of the spiral sketchbooks contains 80 sheets of 120gsm paper. The booklet sketchbook resembles an exercise book, but is more durable and professional, and makes the idea drawing companion for purists. Each booklet contains 20 sheets of 120gsm kraft paper.